Anjani Venusia: In Your Element ~ Retreats COMING SOON NOT TO BE MISSED !! In Your Element ~ Retreats COMING SOON NOT TO BE MISSED !! I wanted to share with you all a short video clip of a 3 day retreat at which I was a presenter recently in Northern QLD. The retreat was based on the 5 elements being ETHER; AIR; FIRE; EARTH; WATER and the significance of these elements to us all on a physical, mental, spiritual and emotional level. I spoke about the wonders of Ayurvedic cooking and the use of food and herbs as medicine. I also ran a discussion about the types of foods to eat and those to avoid for each of the doshas demonstrating how weight management is easy once you know your own unique dosha (consitution) and how this affects your metabolism. 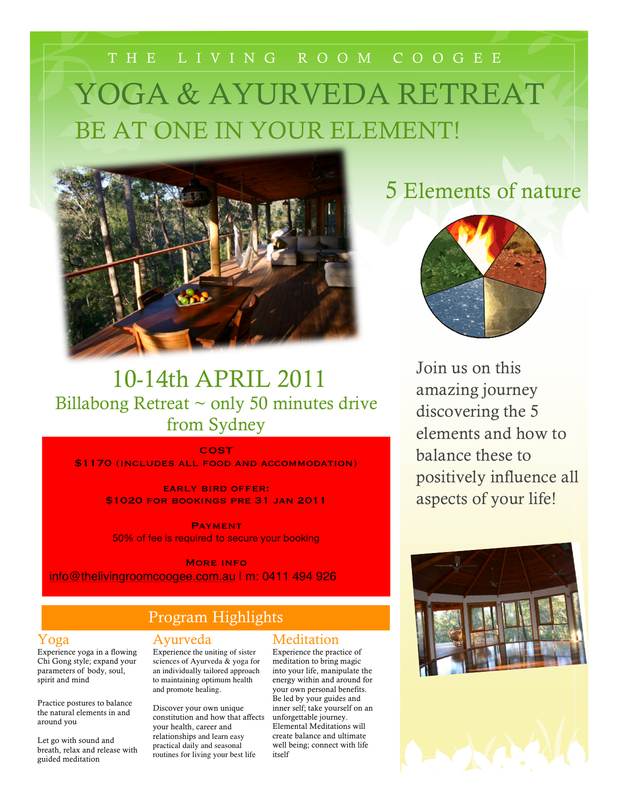 We will be running a follow up retreat in September 2011 no previous attendance required. Contact me for further information and booking forms ~ note spaces filling fast !! 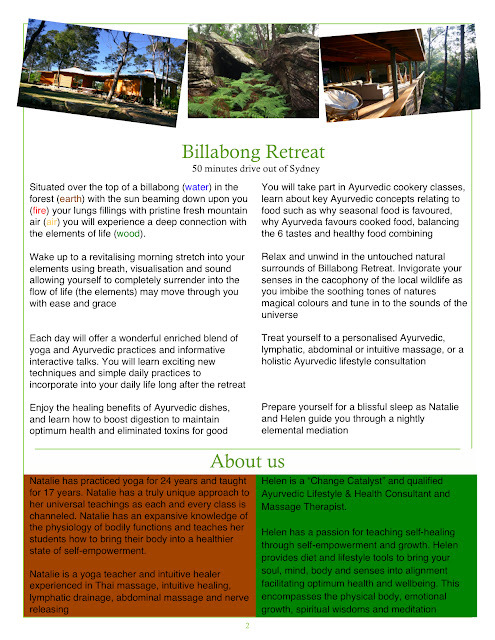 I am running a Yoga & Ayurveda Retreat at the fabulous Billabong Retreat (50 mins from Sydney) in April 2011 with well known and esteemed Hatha Yogi Natalie Almond of The Living Room Coogee. EARLY BIRD DISCOUNTED REGISTRATIONS BEING TAKEN NOW !! HURRY SPACES LIMITED ! !